featuring mandolins, mandolas, guitars and double bass. We are based in Histon, near Cambridge, UK. We rehearse together fortnightly, on Thursday evenings, and work towards at least one public performance each term. Our next performance is at Stapleford Granary on May 19th – do come along and hear us play! We welcome new players – check the Join Us menu above for more details. 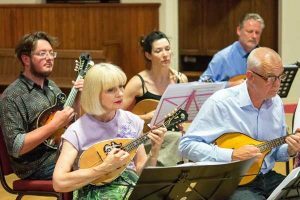 We also organise various social, musical and educational get-togethers, including occasional workshops with visiting professional players. We often share concert evenings with other local instrumental groups and choirs, and have sometimes collaborated with professional soloists to play interesting and challenging concerto works. Some members of the orchestra compete at the BMG Festival and also take part in the British National Fretted Orchestra.